The following information was found on the web in relation to ‘Red Algae Bloom’. 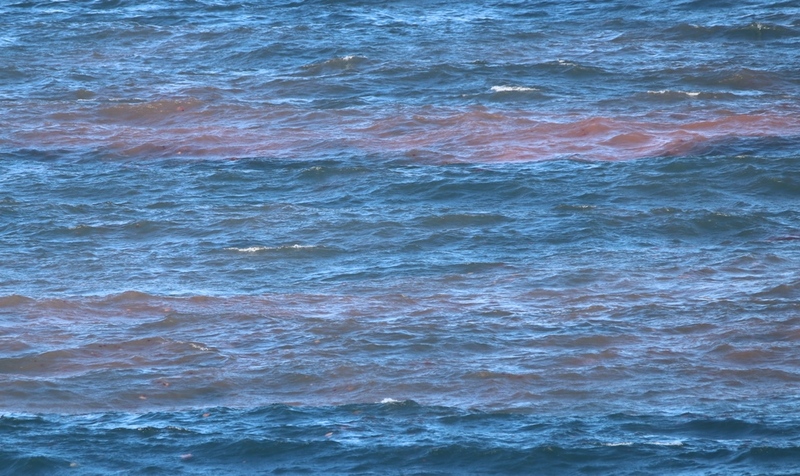 According to Wikipedia the “red tide” is a common term used for a harmful algal bloom. It is not uncommon for it to occur nearly every summer. This bloom is caused by microscopic algae that produce toxins that kill fish and make shellfish dangerous to eat. An article in the Washington Post back in July, reported: “a 26-foot whale shark found dead on Sanibel Island, on Florida’s southwestern Gulf Coast, its body riddled with the neurotoxin produced by tiny algae in the sea. Marine scientists don’t know for sure how it died, but they have a suspect the Karenia brevis algae — a single-celled organism that’s currently in a massive bloom cycle, called a red tide. The red tide has claimed many many victims this year on the Florida coast, which has become a rotting marine graveyard. At least a hundred manatees, a dozen dolphins, thousands of fish, 300 sea turtles, and more have died or washed along shores in putrid-smelling masses. They were all likely felled by the red tide. A BBC report had the following to say: “Since November 2017, the red tide has taken a toll on the marine life around this extremely diverse paradise. At least 29 manatees are confirmed to have died due to the toxin by the Fish and Wildlife Conservation Commission (FWC). Seventy-four more deaths are being investigated. The FWC has documented 588 stranded sea turtles and attributes 318 of them to the red tide. I’m trying to find out if it’s linked to all the red jellyfish currently in the ocean (the lions main jellyfish), which I believe it is. I’ll let you know. A link to the recent story from the Narooma news regarding the jellyfish.